With a land area of just 240 square kilometres, the islands range from low coral atolls to the mountainous majesty of Rarotonga, the largest island of the group and home to the capital, Avarua. English is spoken by everyone, and Cook Islands Maori is the local language. 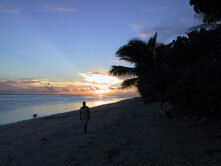 The whole of the Cook Islands population is approx 12,000 with 8,000 on Rarotonga. The currency used in the Cook Islands is the New Zealand Dollar (NZD).Visitors can exchange travelers cheques and principal currencies at larger stores and hotels. Facilities are becoming widespread throughout local businesses, and cash advances on major credit cards are accepted at the Banks and Automatic Teller Machines available on Rarotonga.Cards acceptable for cash withdrawals are Visa and MasterCard, or any card issued overseas carrying the logos Cirrus, Plus or Maestro. Westpac (Simon works there – Manager Operations), ANZ, and Bank of the Cook Islands in Avarua, are open Monday to Friday 9:00am – 3:00pm, with Westpac opening saturadys from 9am to 12pm. All have ATM’s around the island, and money transfer facilities. Banking facilities are also provided at the airport during flight times. Most major credit cards are accepted throughout the island at most shops, and restaurants but cash is always handy. Cook Islanders are devout Christian followers and Sundays is regarded island-wide as a day of rest (most islanders will be at church). You will find very few shops or tourist activities open on a Sunday, other than Wigmores Superstore, Super Brown, petrol stations and some restaurants. Churches are worth a visit, and to hear the beautiful singing. The Office can provide church service details. The Cook Islands are renowned for their pleasant, temperate climate, being sunny most of the year round, and cloud and rain for the rest. The cooler months are June to August, while November to March marks the warmer season, where tropical showers can be expected.The drier months from April to November have an average temperature of about 26°C, whilst the warmer; more humid and damp season runs from December to March. During this season the temperature ranges between 22°C and 28°C. Severe weather is infrequent, but does happen.Go to http://www.mobilegeographics.com:81/calendar/year/280.html for information on obtaining tide calendars, or ask at the Office. Cook Islanders share a genuine concern for others and their old culture lives on through song, dance, legends and an easy pace of life reflecting the nature of the islands in which they live. They are very family orientated and have a lot of love, devotion and respect towards there loved ones.Cook Islanders retain much of their culture and this is passed down from generation to generation. There are restored sites, maraes and also our museum to see. They are also quite religious people with Sunday being a day dedicated to god, with most people spending their mornings at church and a 'day of rest'. Most shops are closed on Sunday and very little activity as it is there 'day of rest'.Other culture is kept alive with dance and song and these can be seen at Highland Paradise or Te Vara Nui Village, or at the special Island Nights at the main hotels.There are very good displays also at constitutional celebrations and with our Dancer of The Year competitions and also Tiare Week. While the Cook Islands are informal and the dress is casual, it is recommended that very brief attire such as bikinis not be worn in shopping areas or public places outside of the beach and resorts. Men should wear a shirt when on the road or in the towns.